When it’s cold and the snow flies is when we get Farm Tough. Our winter programs have something for all players of all ages, Mites – Bantams. They sell out each year. They are a BLAST. They also provide a great gift for the holidays or reward for the special hockey player! Choose from our Main Camp or our Rookies camp! With two camps offerings, our FARM TOUGH ‘Concepts’ CAMP, our main camp for squirts to bantams and our FARM TOUGH Rookies Camp for those ages 6 to 8, there’s an opportunity for anyone to get Farm Tough. The Farm Tough Winter ‘Concepts’ Camp involves both On-Ice training and Off-rink training at the Farm. It is a great way to work on game skills and learn new techniques and secrets to play better hockey. This camp is NOT a skills camp. It is designed to teach you CONCEPTS of the game…how to play the GAME better! That means more fun and more success on the ice! Our Farm Tough ‘Concepts’ Camp will focus on on-ice training, off-ice training, and various events. Players will be divided on-ice according to age/ability. We divide players into 3 teams to compete in the Farm Tough Winter Games. This is what makes our Winter Camp so special…team building, improving social skills and being kids! Our rookies program is designed for the younger player with BIG dreams! 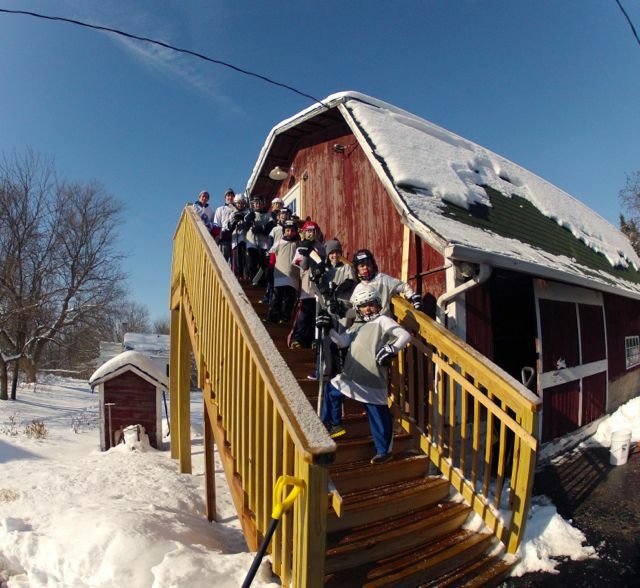 Kids come to the Farm to participate in our Farm Tough Winter Classic. It’s a combination of the Winter Classic and Winter Olympics. We divide players into 3 teams to compete in the Farm Tough Games. Bring your hockey gear and your snow gear, it’s going to real! This is a really fun way to create positive habits for young players, team build and improve on social skills and interaction with other players and coaches! but note both days of USM Camp are on ice. *For description of Beaver Dam Winter Camp, please see description of Main Camp above.